Donatella Versace is finally doing something that stands to be a full circle moment for her and the HOUSE, or should i say The Palazzo of Versace, Resurrecting the original DNA of the brand and restoring the vision that only Gianni could have mastered, GIANNI is back and running at full force Circa 1992. 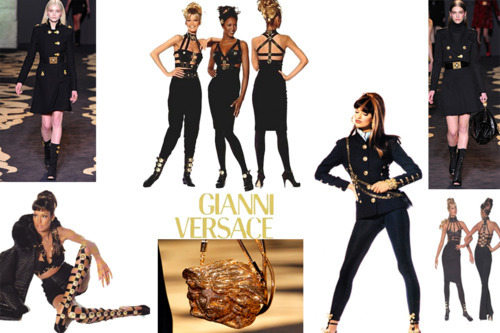 The image of Gianni’s Versace will live on as one of the greatest moments in fashion. While the 90’s where known for minimalism and Heroin Chic, Gianni took no chances and stayed true to all thing beautiful. The excessive look of the Greek goddesses Gianni called his muses, all came together to personify a Moment in fashion that stands as strong as the Corinthian columns of Rome. The classic looks of Gianni Versace circa 1992 have come to be in the hands of the Heirs. Donatella Versace is not having a 90’s moment, rather a moment in time with her late brother. The time was 1992, the ideal of a new democratic president in America, Beauty being defined by Linda, Naomi and Helena, It was great times for the brand, Gianni’s Move to Miami, to the now infamous Casa Casuarina, was only to be in close proximity to the beautiful Latin people of Miami. The brand has seen highs and lows since Gianni’s Death in 1997, and what Donatella is proving now with the Fall 2012 Collection, can only mean one thing, The house is not only Back, its back to a period in time when Gianni was King. The 1990’s will live on for everyone as a period for many new advances and moments. In fashion they say, “the more you are of the moment, the quicker you become part of the past”. If Donatella Versace is trying to recapture, not only the look of the 90’s, but as well as the feeling of the 90’s, the feeling of Excess, Beauty, and New beginnings, then in my opinion she has achieved it, with all things Gianni.